We will soon launch California’s first GeoTour! Discover Milpitas, California - a diverse community that is an integral part of the high tech Silicon Valley. Limited edition inaugural geocoins will be awarded for FTF at each geocache. Or, complete the passport with at least 20 of the 25 geocaches to earn one of these unique pieces. We’d like to share some context and correct any misunderstanding. Of these GeoTour geocaches, 9 of them conflicted with the proposed locations for the GeoTour geocaches. The City of Milpitas - with Geocaching HQ - contacted five geocachers who have physical cache locations (some were finals of puzzles) that were on City or County owned/managed property. We have not yet connected with all of these individuals. Below is part of that email. Let's find a solution together. Below are my questions and we can figure out appropriate solutions as necessary. Do you have permission for this hide? If so, can you provide their name and contact info? I can discuss these with the City. If you do not have permission to have physical items hidden there, please archive your caches. Please know that I'm aware this is a hard and painful thing to do. Would you be willing to allow the City of Milpitas to include this cache into their GeoTour? This means you'll have to adjust the description to refer to the GeoTour and likely edit the cache title since they plan to use a 4 digit prefix on all of them (like this one). The City would be very happy to offer you one of the GeoTour geocoins as a token of their genuine appreciation. To clarify, the option “to allow the City of Milpitas to include this cache into their GeoTour” means the cache continues to exist and continues to be owned by the original owner. That’s a good option. We are inspired by the passion and dedication of the geocaching community - that’s why we wanted to offer the GeoTour in the first place. As a recreation department we envision exposing the recreation of geocaching to a new generation. We hope that any misunderstanding can be resolved and that many geocachers will consider experiencing the Milpitas GeoTour. Some cachers have used existing (older) cache pages as a method of discussing this upcoming GeoTour. The forum page we are on right now is a much better place to have a lively conversation. Cache pages are not the right forum for that discussion, so we ask that you delete your own logs to cache pages that are unrelated to the finding or searching of that geocache. Thanks! The cache owner can also delete logs, per our listing guidelines. Owner is responsible for geocache listing maintenance. As the owner of your cache listing, your responsibility includes quality control of all posts to the cache listing. Delete any logs that appear to be bogus, counterfeit, off-topic or otherwise inappropriate. The City of Milpitas - with Geocaching HQ - contacted five geocachers who have physical cache locations (some were finals of puzzles) that were on City or County owned/managed property. At least one of those caches does not appear to have been on city property, as claimed. It was, however, within 500 feet of a location that the city wanted to use for one of the geotour caches. Does that mean that a geotour is allowed to remove inconvenient caches in addition to those on land that the entity actually manages? Wow! That's incredibly pompous! I hope no geotours ever come to my area. Dump the old caches because they are in the way. Sad. The message to the COs went out just days before the archiving of the caches. This did not allow for any level of problem solving. Also, changing the name of a cache to fit in with the geotour and the CO retaining ownership does not work for puzzle caches. The puzzle caches in this area in particular are incredibly challenging to solve and there is somewhat of a badge of honor in penning your name on the log. To transition that to a standard trad that everyone can log renders the point mute. 1. Assuming that the City approves and chooses to archive certain caches following the geotour, would Groundspeak consider allowing an unarchival of the impacted caches? 2. Assuming that Groundspeak is going to continue to work with Cities to create these geotours, can the company consider enlisting a number of good practices to ensure continued good relationships between the City and the geocaching community. This will also result in a better product for Groundspeak to market. - Reach out specifically to the 10 cachers with the most hides within a 10 mile radius of city center to specifically offer to add their names to a quick reference list for the City contact. Provide all 10 cachers with the City contact as well. Suggest to City that they host a coffee/meeting to gain feedback and enlist the help of the local community. Based on the poor reception of the Milpitas geotour, our community would gladly provide additional feedback. Unfortunate, I would agree with, but I'm not sure how you are using that word. Pompous to me would be a Land Manager creating policies that forbid geocaching, just because they can. If you've ever cached in the Bay Area, and more specifically the South Bay, you'd understand how few the options were for the City. You could talk about grandfathering, but it seems like that would lead to some unworkable solutions in the future. There were still alternatives. Like allowing COs to move their caches over the 528ft and the puzzle owners to modify their checkers to the new locations. If this is a short term Geotours then to allow COs to be able to Unarchive the caches and replace them. I think we (geocachers) have to accept the fact that we are sometimes "products" than "customers". For those lackeys selling GeoTours, we are just the "products" (visitors). The City is the "customer". If Groundspeak, as a company, values us more as "customers (for their listing service)" than as "products (for GeoTours, ads, etc...)", this probably didn't have to happen. That's how I see it anyway, and I'm saddened. We as geocachers, even those of us that pay to use Groundspeak's services are not customers. We only pay to use their free geocache listing service. Obviously, yes. Heaven knows GS won't ask the city to move their cache location to allow a pre-existing cache to continue. I think until we know all the facts that is a little unfair. I looked at things close to the solution for the puzzle in question and it turns out that the city's Chamber of Commerce is about 300 feet away. It may be that having a cache at that location was crucial to the geotour. I will know tomorrow when the cache locations are made available. So there may have been a LOT of pressure to have that particular cache archived, but none of that information was made available to the cache owner. Here is an edited version of some of the comments I posted in the now-locked thread. I think they are still applicable. Yes, the city's parks are pretty saturated; people have been hiding caches in these parks for more than a decade. But the city could have worked with local geocachers instead of taking the brute-force approach of demanding that the existing caches be archived to make room for their GeoTour. In contrast, the MROSD worked with local geocachers when they created their Preserve Circuit Geo-Challenge. And local geocachers are helping and working with the MROSD to maintain the caches in their Preserve Circuit Geo-Challenge. Other agencies and cities should be encouraged to do the same. Yes, it's their land. Yes, they have a legal right to demand that the existing caches on their land be archived. But it would be a lot better if they learned to play well with others. I was shocked and saddened because I've lived in the area since Milpitas really was still 'a place of little cornfields', and my geocache had been in the same spot for 10 years bringing geocachers to Milpitas since 6/22/05. For those 10 years it had highlighted a hidden but beautiful community pond area that includes unique artwork and memorials. I replied that I would move it, but also explaining the situation and asking to cooperate with the city on the hide instead of moving it, but was declined. I appealed and was declined. I was disappointed, but did not want to archive, so I persisted in searching for a nearby spot and after a number of tries I was able to find another spot for my geocache. I was then dismayed when the city's new cache went live 3/23/15, and it turned out to indeed be at the front of the Community Center with heavy foot traffic, and forcing geocachers to walk through the planted area to get to it under the front window. So much for the city's beautiful unique location my geocache had brought hundreds of geocachers to before I was forced to move it. I see now that the same cache has become the first in the GeoTour series, GC5NWTH, but it looks as though the city has moved it a bit. At the time this happened to me I was disappointed with what I thought was an overeager Milpitas Parks and Recreation employee who had discovered geocaching, but who was unwilling to work with a long-time geocacher. I was also disappointed with the reviewer and with Groundspeak for not better educating the city staff. City staff could have chosen to embrace the grassroots nature of how geocaching came to be in the first place and embrace the amazing group of people who comprise the local geocaching community. To see this GeoTour now playing out as it has is sad. While it does look as though an attempt was made to engage the cache owners, it looks as though the city either was still not fully informed of the impact their actions would have or they were told, but again chose to go down the path they did anyway. I see that BearTerritory, who also grew up in the area, has provided suggestions. I hope they are taken to heart and that the city staff targets a date for archiving their GeoTour caches that caused the archives and then allows the affected geocachers to have their geocaches unarchived. Given that this is being announced as California’s first GeoTour and similar programs have occurred and are being developed elsewhere I also hope Jeremy, Elias, Bryan, the Lackeys, and Reviewers are taking note in order to help other cities avoid the same missteps. It's too late for Milpitas, but one solution to avoid conflicts in the future would be to waive the proximity rule for GeoTour caches only. Nearby caches could be clearly marked with their titles and GC codes, and notes in descriptions could caution cachers to be sure they've found the right cache. This would keep everyone happy cachers while we all promote geocaching in the community. As I stated in the locked thread, if this is going to be a promotion from Groundspeak then perhaps the best middle ground is to 'grandfather' the existing caches and allow the GeoTour caches to be placed without regard to the 0.1 mile/528 ft rule. This is Groundspeak's rule, it did not exist until Jeremy and friends created Geocaching.com. There have been a few "facts" that were simply not true (they were based on incorrect assumptions) posted in earlier comments here and elsewhere. That was the reason for the first few posts in this thread. We hope those who have been passionately discussing are now passionately discussing and moving forward with the actual facts. The GeoTour page is live and the first post has been edited to provide the link. Not all the caches are being published today. More will be published later. You assure us that you have the landowner's and/or land manager's permission before you hide any geocache, whether placed on private or public property. I've been reading the posts on the new listings, seems the coordinates are off on most of them and they are in in high muggle areas. It may have been a good idea to enlist a few local geocachers to help. Also it appears that several of the coins placed as FTF prizes are being found by one team. Looks like the city got a few sponsers when they actually needed a few helpers. I'm guessing that cache ownership for them is gong to be more than they expected. Why don't you share with us the actual facts, then? The property in question is currently owned by two individuals, not by the City. We hope those who have been passionately discussing are now passionately discussing and moving forward with the actual facts. I, personally, have been withholding judgment about Groundspeak's role until I get all the facts. I have repeatedly requested "the facts" for the most problematic archival, and no response has been forthcoming. So I ask again: why did Groundspeak HQ archive a cache for this geotour that was on property not owned by the City of Milpitas? Despite what it says on the GeoTour page "Limited edition inaugural geocoins will be awarded for FTF at each geocache" the FTF Geocoins are not prizes. They are activated and owned by MilpitasRec. 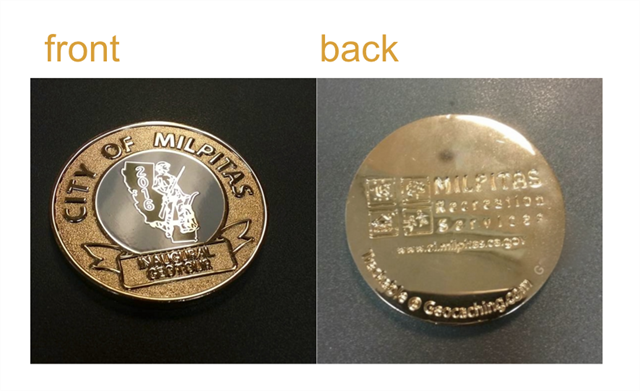 The question is "Are the Geocoins awarded for completing the GeoTour also activated/owned by MilpitasRec?" Confusing isn't it? I'm guessing that the city of Milpitas went in this venture without much knowledge of geocaching. The caches have all the markings of a noobie. I'm uncertain by the assumption made in the bolded part. I understand that the bulk of the City Listings are in Parks owned and operated by the City, but it's unclear where the Puzzle Final was located that you're referring to. If it was on a residential street, I would have to agree with Groundspeak that the land is owned (or at least the right of way) by the City or the adjacent land owner. If the Puzzle Final was in a parking lot or something similar, it's not a City issue. In both cases, it seems like the conversation between the Cache Owner and Groundspeak would have been different if permission was secured. It's a recreational facility currently owned by two individuals, not by the City. Not sure why this continues to be thrown at us as the reason for archiving caches. Is it now the stance of GC HQ to archive every cache globally that does not have a signed letter of permission! This is not productive to the issue at hand. It's a recreational facility currently owned by two individuals, not the City. Either way, the permission aspect of the problem continues to be overlooked or dismissed. I still don't think it's rightful that the City requested the archival of an existing cache due to the lack of explicit permission from the landowner which is not the City. I see it like arresting on a charge of convenience. But that's not my point. I just wanted to know what the so called "actual facts" are, when we were told what we believe is the fact is not actually so. I still don't think it's rightful that the City requested the archival of an existing cache due to the lack of explicit permission from the landowner which is not the City. I see it like arresting on a charge of convenience. I guess I see your interpretation of cache placement "rights" is based upon "adverse possession". Does a cache placement have greater rights than another, newer placement, with documented permission, merely by virtue of it being active longer? I'm not sure I have the answer to that question. I would probably have to lean towards the permission-trumps card on that one. It has always bothered me, just what is explicit permission? Can some one define it? Nothing but complaints about the vast majority of coordinates being off, including coordinates in a backyard, incorrect terrain ratings, vegitation damage, nearby trash (always CITO), a hide next to a kiddie playground, a commercial listing (“This is a special cache from our Premium sponsor Amalfi Apartments. A new life awaits at these apartments”), already activated/registered FTF Geocoins, city requested archive of caches on non-city owned property, and “0” Favorite Points. I think that sums up the day one success of the first California GeoTour. The good news is that it can’t get any worse (I hope). I don't agree. I think we all understand that many (most?) caches could be archived today if written proof of permission were required. The issue here is different: it appears (note that I say "appears" instead of claiming a fact) that Groundspeak took money from an entity and then came up with pretexts to archive caches that interfered with their desired cache locations. Here's why that looks bad. Let's suppose I am a geocacher and I find a location that would be just perfect for my new cache. Unfortunatey, the hide location is blocked by one or more existing caches. So it appears that I can now obtain written permission for my hide, and then, without contacting any of the affected cachers, pay Groundspeak to find reasons to archive the nearby caches for me. I really, really, really don't want to believe that Groundspeak would do such a thing. That's why I am so anxious to get the facts about what actually happened. - email or written approvals from private land owners. - the permit system for Washington State Parks caches (which also requires a permit statement on cache pages). - email permissions from the superintendent for my caches in North Cascades National Park. - the email agreement and cache guidelines for all caches in Cougar Mountain RWP (which I have on file as cache liaison). This cache was placed with the permission and support of the City of Issaquah. This cache placed with the consent of King County Parks and the Cougar rangers, who consider geocaching part of their outreach and education program. This cache was placed with the support of the Interpretive Specialist, and approved by the Superintendent, North Cascades National Park Service Complex. Regarding cache conflicts: For the WA State Parks GeoTour, three parks were removed from consideration because they had existing caches that blocked new ones. For the Rainier GT, we worked with land managers on alternate placements for a couple of caches. In no cases were preexisting caches forcibly archived to make way for GeoTour caches, even though it was "their" land and it meant the GeoTour had to eliminate a cache or accept a less-optimal placement. That's just not how you build support for your GeoTour, and it's something I stress with my GeoTour clients. If there truly wasn't room for the new GeoTour caches for the Milpitas GT, then starting early and working with local cache owners could have been hugely beneficial, built relationships, and produced positive results for everyone involved (with perhaps a little compromise on all sides). It would be good business for Groundspeak to take a more active role in ensuring that GeoTours are rolled out successfully to the community by recommending or providing guidance on implementation (everything from working with the local community to creating good caches). Their business folks don't have this bandwidth, but they could have a list of geocachers with experience working on GeoTours and provide it to GeoTour customers, especially those who don't have the background, knowledge, or resources to execute a GeoTour in optimal fashion. Local geocachers would also be a great option, altho geocachers with GeoTour experience know additional nuances about these large series (GT requirements, dedicated pages, special review cycles, costs, prizes, and whatnot) that go beyond the usual cache placement and community concerns. Why must explicit permission be written? IMHO, if I know the person in charge of the property, speak with him, discuss the cache placement with him, and hear him tell me that he approves of the cache placement, then I have explicit permission. And what about parks and open spaces with written geocaching policies? Does it count as written permission "for the cache placement" if the policy specifies that caches that meet certain requirements are allowed, and my cache meets those requirements? No one in the organization has looked at my specific cache placement, and the geocaching policy does not require that. So much fail. If Milpitas had learned about geocaching before doing this. If Groundspeak had educated Milpitas before taking their money. If everything hadn't been done at the last minute in order to cash in on the Super Bowl. Milpitas looks bad. Groundspeak looks bad. The community is really annoyed. Everyone loses. Moral of the story: if Groundspeak is going to take money to promote more GeoTours, they need to do a better job of managing them. This one was clearly a massive failure on every level. The simple solution is still to relax the .1 mile limit for GeoTour caches. Then GeoTours can do what they want without impacting anyone else. Groundspeak's arbitrary rules caused the problem, they can solve the problem with an email. Reinstate the old caches and leave the GeoTour caches as they are. Of course it can be oral, but that written permission comes in handy if you need to prove it to Groundspeak (as is the case in many restricted areas) or to an employee who doesn't know that the boss gave permission. Sure, and I covered that in my examples. Sorry if I wasn't clear enough. You sound kinda combative, but I think we are on the same page. Oral should be just fine. Groundspeak needs to learn to accept oral. That what I use. niraD does sound combative, he just asks very pointed and honest questions. We're all kind of touchy here right now. This situation has already caused pain to the cache owners, damaged relationships within our community and between the local community and the city and Groundspeak. We are really hoping to get some answers from HQ tomorrow in order to start figuring out how to move forward and heal some of the wounds. Did Groundspeak, at the request of the City of Milpitas, archive a cache that was not on City of Milpitas property? We can discuss whether it was policy or a mistake and how we deal with it later, but we need that answer. The greatest unspoken issue here is far greater than geocaching.. it's the abuse of power by a government entity. I'm not sure I would call it abuse of power by a government entity, which is some thing the government entity can do on it's own. In this case it took a willing independent third party to do it's will. And perhaps a bit of gold to ease any pangs of guilt. I don't care how you sugar coat it, it's still an abuse of power. Name one abuse the city performed by exerting of their authority. They are a customer of GS and used that position to demand things they felt they should get for the money they would spend. It appears those requests were not respectful of the game they chose to join. But it is an abuse of logic to say they abused their governmental power. Where is Groundspeak in this Forum and why are they not responding to this question? To further the point, none of the 16 initial geotour caches were placed within close proximity of the final coords to the affected puzzle. Given that the next round of geotour caches will not be released until June 2016, there seems to be ample time to resolve this situation and reinstate this cache that seems to have been inappropriately archived. To further the point, none of the 16 initial geotour caches were placed within close proximity of the final coords to the affected puzzle. Given that the next round of geotour caches will not be released until June 2016, there seems to be ample time to resolve this situation and reinstate this cache that seems to have been inappropriately archived. MilpitasRec told me "the remaining caches would be released on Saturday". I visited the Community Center today to exchange my Geocoins (activated for unactivated). Publishing the remaining caches in June does not make sense since there was the urgency (and the press release specifically mentions this) to put the GeoTour together prior to the Super Bowl. You need 20 codewords to earn an award/geocoin. For the most part, I agree completely. The one point I disagree with is that their business folk don't have the bandwidth. They may not currently have the bandwidth, but if Groundspeak continues to promote GeoTours, they need to make the bandwidth. The GeoTours that I have done have had good caches, quick response to NM logs, and have been fun and sometimes educational. Some of the caches have been commercial, but not to the point that they have turned me off of them. In my opinion, GeoTour caches need to be held to a higher standard, and that includes not ticking off the local cachers. That takes planning up front, and GS needs to involved in helping out the sponsor with some kind of best practices. They also need to be willing to put a hold on a GeoTour if issues arise during the planning and setup. On the other hand, I've not heard of any issues on any other GeoTours outside of this one, and one in the Atlanta area. Both of these are recent GeoTours. And, it seems like there is a new GeoTour every other week. So, is this a case of the GeoTour group within GS getting swamped, and letting things fall through the cracks. Maybe this is growing pains within GS? As each day passes without an answer from TPTB to my very simple question, my concern about their behavior rises. I am still trying very hard to give Groundspeak the benefit of the doubt, but their apparent ignoring of this thread is making it more and more difficult. I believe the crickets are saying yes. A cache was was archived to make way for a City of Milpitas cache that has not yet been published: GC69DBG. They were about 58 feet away from one another. It is within the City of Milpitas boundary. 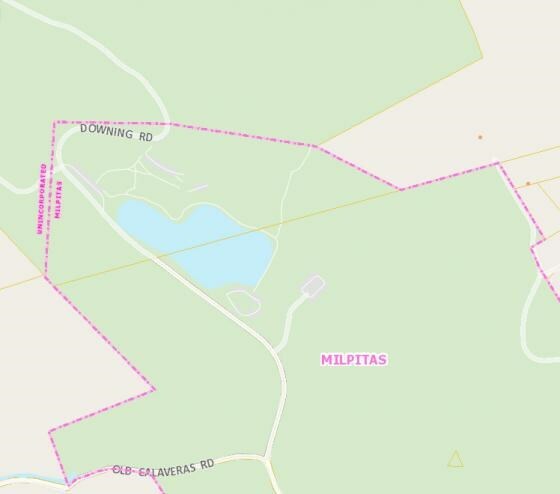 The image below is from County of Santa Clara's Parcel Map. A cache was was archived to make way for a City of Milpitas cache that has not yet been published: GC69DBG. Thanks for the response. I really appreciate it. However, that was not the cache I was referring to. The cache in question is GC25RWX. I'm sorry that I was not specific enough in my question, as I thought it best at the time to leave the identifying information out. The one you refer to is arguably on Milpitas city property and thus not really a problem. The one I am referring to was not on Milpitas city property. We are talking about different caches. The other one of the forcibly archived caches is NOT on the City's property. Again, it's currently owned by two individuals, and the actual cache location is NOWHERE close to the map posted above.